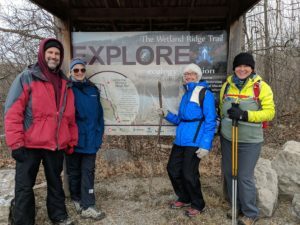 Five merry hikers enjoyed delightful mild winter weather, hiking on the wooded trails and through parts of the towns of Niagara-On-The Lake and St. Catherines, Ontario. We hiked 7.6 miles, the second segment of Ken Martin’s 3-part Laura Secord Historical Trail series. It was a joy to hike in the Woodend Conservation Area along the scenic Niagara Escarpment, where our microspikes were invaluable on the wintry terrain. We passed the Niagara College Vineyards, and the modern Wine Education Center and Teaching Brewery. Also on campus we the viewed the inspiring First Nations, Metis and Inuit Gardens. We crossed the impressive Welland Canal, currently drained since it is closed for the season. It was fascinating to see the dredged canal construction that support the Great Lakes shipping operation. We passed through an historical region of St Catherines which included the beautiful Victoria Lawn Cemetery where many historical figures are buried. We walked along Dicks Creek and viewed the gigantic Totem Pole in Centennial Gardens Park. We then walked passed Brock University’s new downtown campus before crossing the robust Twelve Mile Creek to our end point at Rodman Art Center, also part of the Brock U campus. It was fun to get a taste of Canadian woodlands and culture. 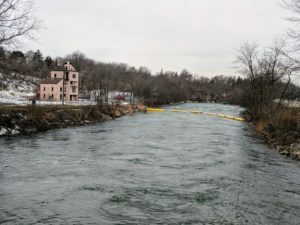 The final segment of the Laura Secord Trail will be a 6-mile wooded hike on Saturday March 3.